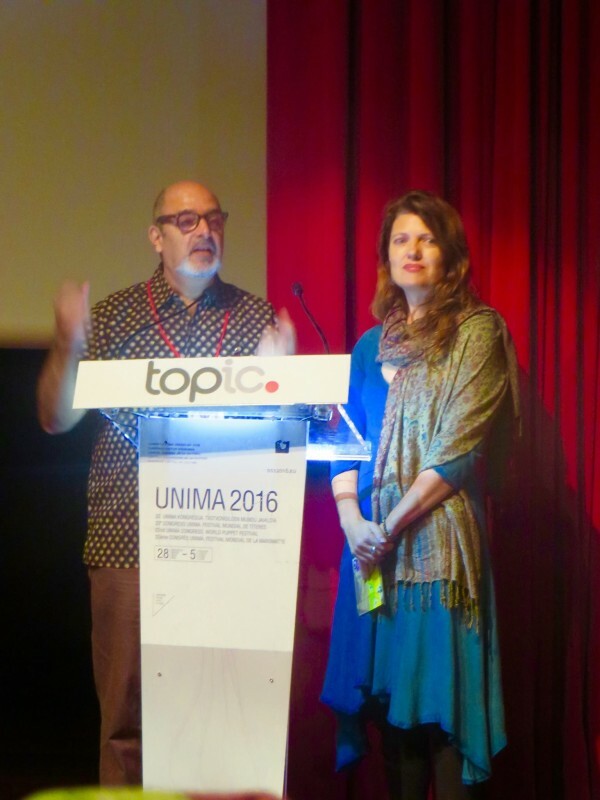 ASSITEJ President, Yvette Hardie, was invited to attend the 22nd UNIMA World Congress and World Puppet Festival in San Sebastian and Tolosa from 28 May to 5 June 2016. At this historic meeting, she was able to discuss ideas with current leadership and members of UNIMA, and on the 4th day of the Congress, re-elected UNIMA President Dadi Pudumjee and Yvette were able to make a public announcement that they would find ways to work together more collaboratively as International Associations. There is a commitment to developing the details of this collaboration in the next term of UNIMA and to finding ways to synergise better and support one another, on the basis of shared values. The wording of the commitment reads: We commit in principle and in practice to collaboration and cooperation between our associations on matters of mutual interest, where appropriate. We do this in order to advocate the theatre and the arts as a universal expression of humankind, as fundamental to human, social and cultural development, and as a bridge-builder for mutual understanding and tolerance as enshrined in the Universal Declaration of Human Rights. ITI (International Theatre Institute) and AITA/IATA (International Amateur Theatre Association) have already committed to this collaboration, and ASSITEJ is in discussion with IDEA (International Drama/Theatre and Education Association), IATC (International Association of Theatre Critics) and OISTAT (International Organisation of Scenographers, Theatre Architects and Technicians) to collaborate as well. We believe that at this time, working together, synergising efforts and creating a stronger advocacy for the role of the arts in the lives of every human being through using our collective voices is tremendously important. One of the concrete ideas under discussion is to create a Performing Arts Week, which incorporates the 20-27 March, is celebrated annually and universally, and would include the World Day for Theatre for children and young people (ASSITEJ – 20 March), World Puppetry Day (UNIMA – 21 March) and World Theatre Day (ITI and IATA/AITA – 27 March) in such a way that these distinct individual celebrations would not be lost, but that there could be a greater momentum towards which we can all contribute for the notion of theatre/performing arts as central to our birth right as human beings. ASSITEJ thanks Dadi Pudumjee (UNIMA President) and Idoya Otegui Martinez (newly elected UNIMA Secretary General), as well as outgoing Secretary General, Jaques Trudeau, for their interest in pursuing this collaboration.